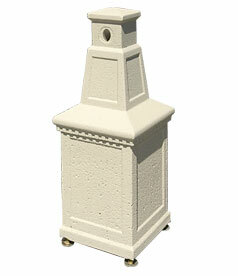 The straight square classical styling of this precast concrete cigarette snuffer will grace any setting. Rugged and durable, this cigarette snuffer will encourage safe odor controlled disposal of smoking materials. Built to last, these cigarette receptacles are made with steel reinforced concrete. This smokeless precast concrete cigarette snuffer is available in multiple colors shown below. The decorative style of this cigarette receptacle makes it an ideal choice for any location where smokers may congregate. Available in nine smooth stained concrete colors or nine weatherstone stained concrete colors. These concrete cigarette receptacles are perfect for keeping unsightly cigarette butts from littering your walkways or building entrance.